NISAR, an acronym for NASA-ISRO Synthetic Aperture Radar, the ambitious collaborative project between NASA and ISRO, is expected to be a milestone in next-generation satellite innovation and opens up a new chapter in Indo-US space partnership. In a report from Geospatial World's online infosite by Aditya Chaturvedi, this unique project is set for launch around December 2020 and will spearhead a number of technological advances and will usher in a new age of Earth monitoring satellites with unprecedentedly powerful resolution, this according to Dr. Paul A Rosen, a senior scientist at NASA's Jet Propulsion Laboratory and Caltech. Dr. Rosen, who is involved in the project, was speaking at the at the 38th ACRS (Asian Conference on Remote Sensing) that is being held in New Delhi from October 23 to 26. 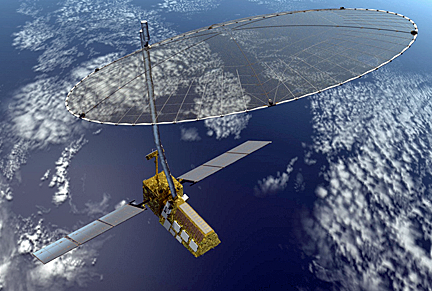 Artistic rendition of the NASA-ISRO Synthetic Aperture Radar (NISAR) satellite. Image is courtesy of JPL/Caltech. What makes the NISAR project more gargantuan in scale and scope and breathtaking in vision and ambition is the amount of money that both space organizations will invest in the satellite – $1.5 billion — making it the world’s most expensive satellite manufactured to date. NISAR will also be the world’s first dual frequency radar imaging satellite and will be used to monitor and observe a wide range of natural phenomenon from outer space and will have many applications for multiple fields and domains. NISAR will have two frequencies bands — L- and S-band. The L-band is for low temporal decorrelation and foliage penetration, while the S band is for sensitivity to lighter vegetation. The former is being developed by NASA and ISRO is working on the latter. NISAR will be launched aboard a GSLV Mark-2 rocket that would be provided by ISRO. The satellite would send detailed sampling report in every 12 days. The satellite will mainly focus on global coverage, vector measurements and dense sampling in time. It will monitor and analyze global dynamics of ice sheets and sea ice, wetlands and arable land and the change in biomass. NISAR will also help in disaster prediction and a swift response to it, infrastructure monitoring, and forestry and agricultural applications.